In addition to the conversation pit, the recessed space also reminded them of a swimming pool. Both social environments are meant for pleasure, but come with a set of rules, whether implicit or explicit. (No diving, for example.) 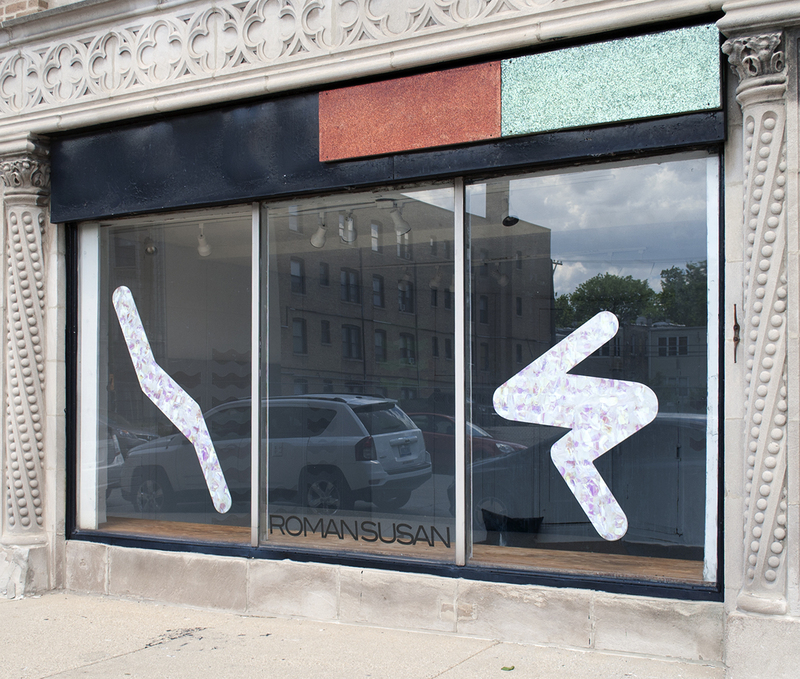 To foster the social theme, Roman Susan invited artists to host events at the space three times a week. Programming was split between the curators and Kristin Abhalter and Nathan Smith, who run the gallery, so a geographically diverse range of artists are participating, from Chicago’s Esau McGhee to St. Louis-based Cole Lu. Lacher and Robinson are also artists and they have filled the space with fabricated items meant to evoke the social environments that inspired the show. Abstract decals of divers grace the storefront windows. 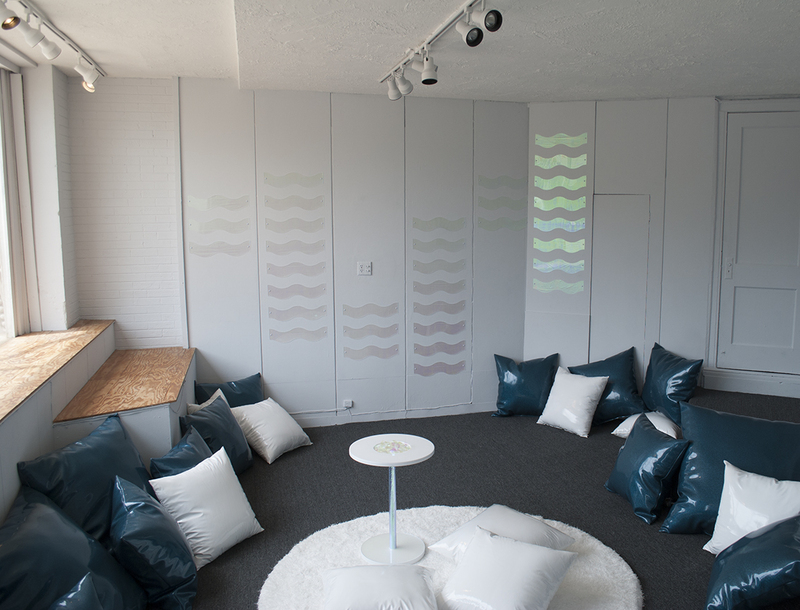 Shiny white-and-blue-hued pillows are piled along the walls. The exhibit’s inaugural event, a video screening by Colleen Plumb in mid-June, fit the theme perfectly. On the gallery walls, a polar bear paced along the edge of a pool. A circus elephant on one leg slowly turned in a circle. The looped videos are part of “Removed from the Domain of Struggle,” a series by Plumb that explores the repetitive behaviors of animals in captivity. Plumb films the animals for hours, but the shorter clips seen here over and over again, are all you need to understand their cramped confines. Outside the gallery, other videos played on the concrete wall below the Loyola ‘El’ stop from a projector mounted on Plumb’s station wagon. Each event is sure to produce a wholly different experience, from Hideous Beast’s DIY fireworks demo to Mike Rea’s “performative margaritas,” all forthcoming. Lacher and Robinson have worked collaboratively for the past year. Together, they manage the Visual Arts Gallery at the University of Illinois, Springfield, and also run Demo Project, a gallery housed in a building owned by the Springfield Art Association that is slated for demolition. Lacher and Robinson encourage artists that show at Demo to experiment. The contemporary art scene in Springfield is small and Demo Project has been a vital part of it for almost three years. 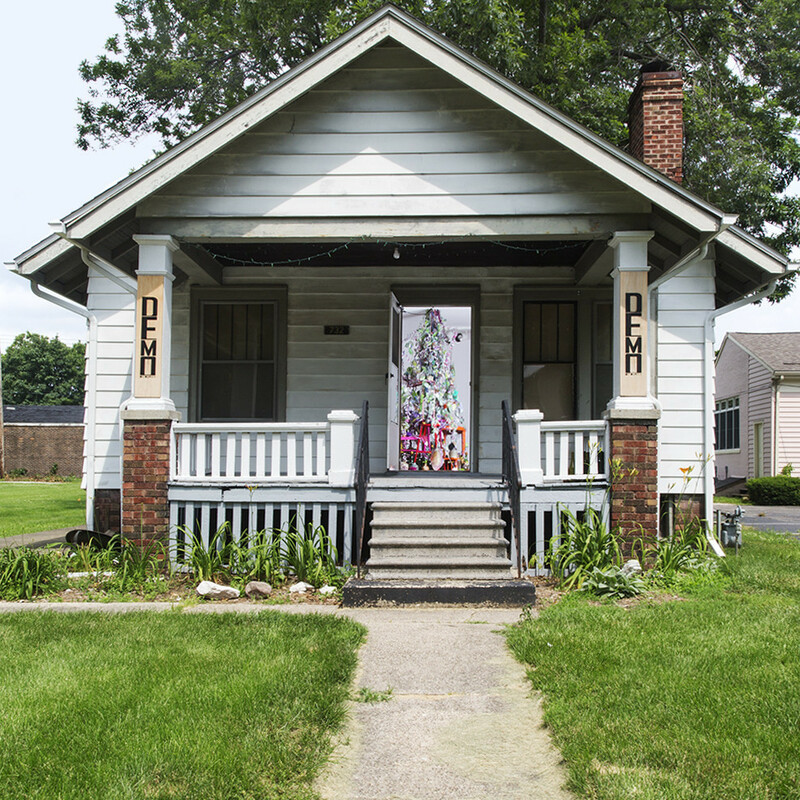 Demolition could come within the year, so the gallery has been ramping up programming, recently opening a second exhibition space in the same house.